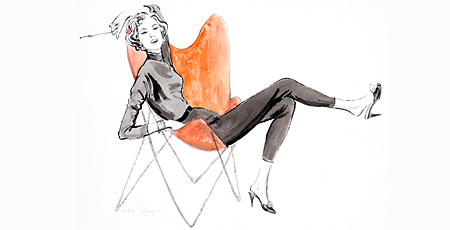 Hilda Glasgow was a fashion illustrator, much in demand by magazines like Vogue in the 1940s-60s. Born to Russian immigrants, Hilda's parents settled in Brooklyn. Her father was a jeweler, her mother owned dressmaking shops, and they encouraged their four daughters to learn a profession. Hilda went to Pratt, graduating in 1933, and eventually got illustration work from magazines and department stores. The creativity and enterprising genes were evidently passed to Hilda's daughter, Elizabeth Glasgow, a photographer. Elizabeth has collected 50 or so of her mother's drawings and is selling prints of them on The White Cabinet. The delightful pen and ink drawings are custom-printed on heavy fine art paper and start at $95.